Odyssey introduce their new red ball putter. All golfers know that holing putts is the name of the game. You can hit the ball great off the tee and fairway but if you cannot get the ball in the hole then your score does not reflect your ball striking. 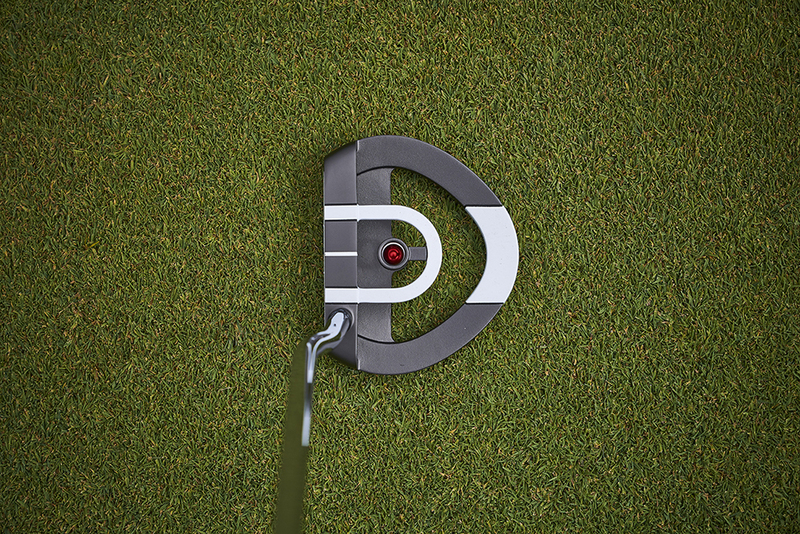 This putter aims to help the golfer hole more putts by using the latest Odyssey technology. Correct set up and alignment are extremely important and if you do not get this part right, you will not hole those crucial putts. Odyssey have developed this by putting a little red ball on the sole of the putter that is visible through a scope which is on top of the putter. If you are stood over the golf ball in the correct position then the golfer is able to see all of the red ball. This ensures that your head is in the correct position over the ball. If you are not able to see all of the red ball then you are not positioned correctly. Odyssey have also used their proven Versa high contrast alignment system using the difference between the black and white bands which helps the golfer to square up the clubface to the target. Using both of these aids ensures you are set up and lined up correctly. This putter also features Odyssey's white hot RX insert in the clubface. This consists of an oval mesh pattern embedded on the front of the softer core insert which creates a soft feel off the face, a better more consistent roll towards the hole and a lovely sound as it comes off the face. The Red ball putter comes with a mallet shaped head, the weight having been taken out of the centre of the head and distributed to the outer edge. This increases the Moment of Inertia (MOI), that being the resistance to twisting at impact,ensuring more putts go on line. Add all of these factors together you have a putter which will significantly improve your putting helping to shoot lower scores, to bring your handicap down. This putter comes with either a 33/34/35 inch shaft and is available in either a left or right handed model. Right or left handed model.